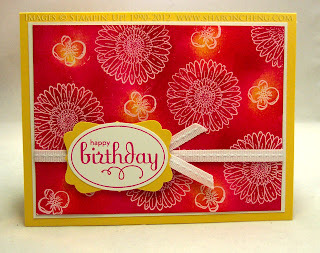 In my July newsletter, there was a card made by Stampin' Up! that inspired this card. The embossing resist technique was perfect for featuring the Reason to Smile stamp set. With this technique, you use clear embossing powder on a light colored paper. When you sponge on darker inks, it makes the embossed images pop. I started by stamping the two flowers on watercolor paper with Versamark and heat embossed with clear embossing powder. Then I sponged on Daffodil Delight and Melon Mambo. The inks blended nicely on the watercolor paper. The Reason to Smile stamp set is Stampin' Up! 's July promotion. When you buy $50 in product (before shipping and tax) the stamp set is only $5. I'm also offering a special on Stampin' Up! 's new firm foam ink pads to my newsletter subscribers. When you buy 5 ink pads, the 6th one is free. Sign up for my newsletter to get the coupon for the ink pad special. Combine both specials for extra savings! Both specials end on July 31st.